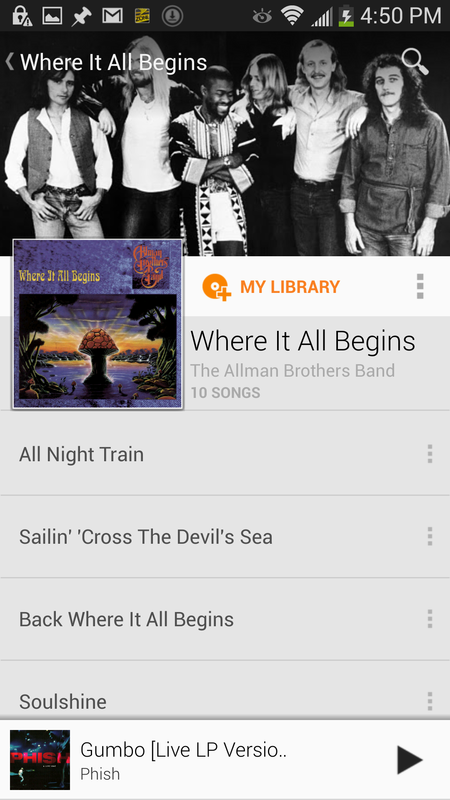 On Wednesday, Google joined the likes of Spotify, Mog, Rdio, Rhapsody, and Slacker with the U.S. launch of its Google Play Music All Access subscription music service. For $10 a month (or $8 a month if you sign up before the end of June) you get access to untold millions of tracks on Android phones and tablets, as well as via your Web browser. I spent some time playing around with All Access and the updated Play Music app on a Samsung Galaxy S4, and here are my initial impressions. Hint: All Access looks promising, but needs more polish. Obviously, the most important part of a subscription music service is what you actually get when you subscribe. In terms of sound quality, I was very happy with what Google serves up. I couldn’t find any info on the format or bit rate that Google uses, but there is a Stream at highest quality only option in the settings. (I had it unchecked and still found the quality good.) You can also limit streaming to Wi-Fi only to keep from burning through your data plan. 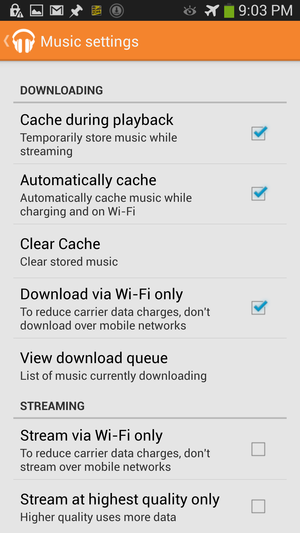 The app's settings let you choose streaming quality and more. 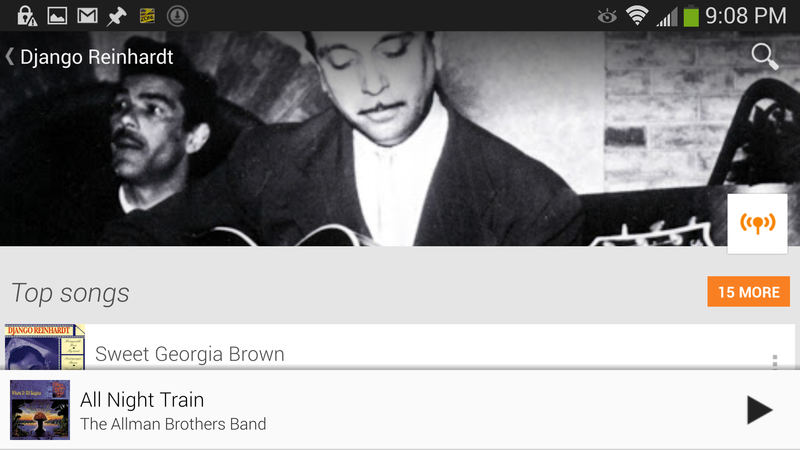 Google touts more than 18 million tracks for sale on Google Play, but only speaks vaguely of “millions of tracks” when it comes to its streaming service, so it’s hard to say just how it compares to the likes of Spotify. A quick check of both services, however, showed that All Access stacks up pretty well in terms of the depth of its catalog. Or to put it another way, you won’t feel cheated by what you get in return for you monthly fee. There are a few strange things about how All Access chooses to display content, however. In addition to an artist’s abums, the service seems to also list albums on which that artist appears. For example, under Eric Clapton’s albums you’ll find Buddy Guy’s Blues Singer, presumably because Slowhand plays on a few tracks. But you’d never know that from the album because all you see are track names. Another oddity: In a list of top songs for Ray Charles, Kanye West’s “Gold Digger” shows up. Yes, I know it’s built around Charles’ “I Got a Woman” but it doesn’t belong on the list. After updating the Play Music app and signing up for the 30-day free trial, I was immediately able to start listening with All Access. 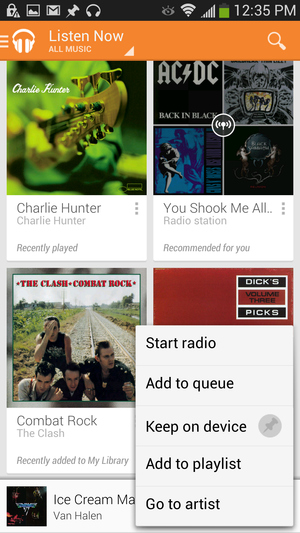 The main screen offers five menu options: Listen Now, My Library, Playlists, Radio, and Explore. Visually, it’s impossible to distinguish between songs and albums because all you see is an album cover, and must tap it to show whether you added a whole album or just one track. Also, albums that I revisited a second time were confusingly listed multiple times under Listen Now. 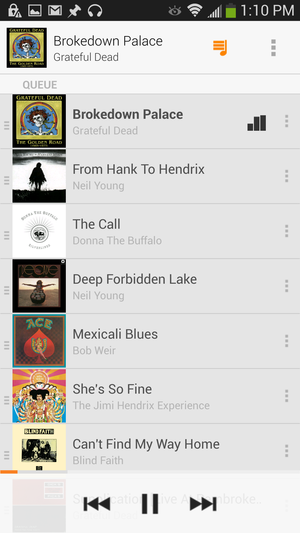 My Library shows the genres, artists, albums, and songs in your library (either local or everywhere). From there you can drill down into albums to play (although art was often missing from places it was supposed to be), or easily start a radio station based on a song, album, or artist. Tapping an artist name takes you to that artist’s page on All Access and shows you the artist's music that's already in your library, as well as top songs, top albums, and related artists. During my time with the service, the related artists seemed pretty accurate. 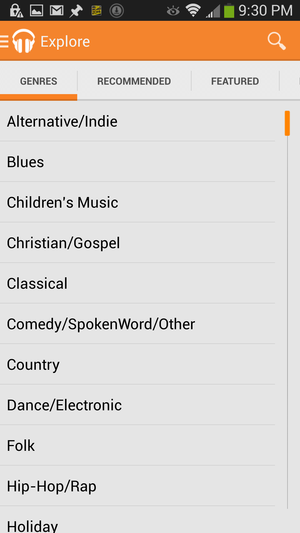 The list of genres in Explore. Playlists shows your recently created playlists, auto-generated playlists based on what’s in your library, and then all your playlists at the bottom. Adding an album to a new playlist unfortunately doesn’t name the playlist after the album. Instead, you get a generic Playlist 1 with the opportunity to rename it. Radio shows you any stations you’ve built, and also gives you the option to create a new station. When you tap Create new station, you’re prompted to search for something to base it on. On the S4’s screen, the search box reads Search for an artist, so…. I assume this means you can also search for a song (and perhaps other things) to base your station on, but the truncated label makes it difficult to know for sure until you actually begin. The results come up as you type (a nice touch), and offer you artist, album, and song stations to choose from. Finally, Explore lets you look around the content by genre (and sub-genre); offers recommendations; displays featured playlists and top songs/albums; and shows you new releases. Even though the app works in landscape mode, the UI is clearly not designed for it. For example, the image at the top of the screen on an artist page zooms nicely enough when I rotate the S4, but the interface doesn’t do much to take advantage of the wider space. You just end up with less information on the screen. Landscape mode isn't particularly useful. Once you start listening to music—whether you’ve chosen a song or started a radio station—there’s a strip at the bottom of the screen that shows what’s playing, complete with song title, artist name, and album art on the left. On the right is a play/pause button for quick control. 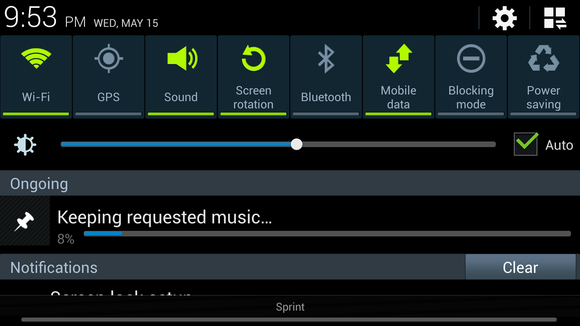 To move to the previous or next track in the queue, just swipe your to the right or left, respectively. The full-screen experience when immersed in playing a song. When you tap on a album to open it up, you can tap to play a song. 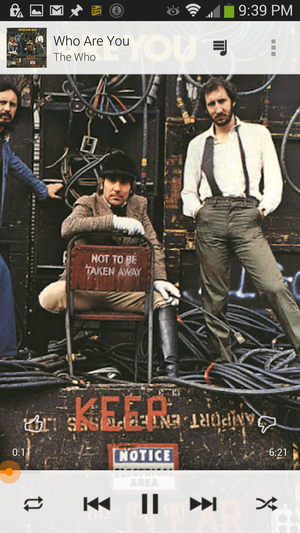 In order to play the whole album, you tap the album cover, but I only discovered that by guessing because, again, the app doesn’t tell you. If you tap the song in the bottom bar, the interface moves into a full-screen song experience. The album art scrolls gently back and forth across the screen, while playback controls grace the bottom of the screen. It’s not too distracting, but if you suffer from motion sickness, you might not enjoy the effect very much. You’ll also find ‘Thumb up’ and ‘thumb down’ buttons. Tapping them apparently helps All Access figure out what music you do and don’t like to aid with future suggestions, although the app doesn’t tell you either way. The bar that was at the bottom of the previous window moves to the top in this view, with the same swiping controls and ability to display and manipulate the queue (tap the icon with a musical note and a bunch of lines) and initiate other commands (like start a radio station based on that song, go to the artist’s page or the album the song is from, and clear or save the queue) as when it lived elsewhere. Within a play queue, you can swipe to remove a song, or tap and hold on the far left of a track to then drag it and change its place in the queue. Because you’re not always connected to a robust Wi-Fi network everywhere you go, the ability to download music for offline listening is crucial. All Access offers this feature, but the process isn’t smooth or intuitive. An album page, with the option to add the album to your library. 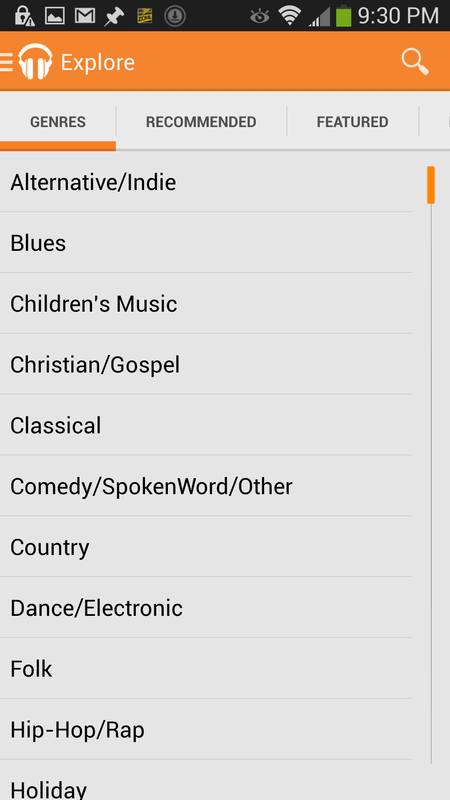 On an album page, for example, tap the orange My Library button to add it to your library of songs. Once you’ve added the album to your library—you can only save content after doing so—the My Library button disappears and you then see a pin button instead. 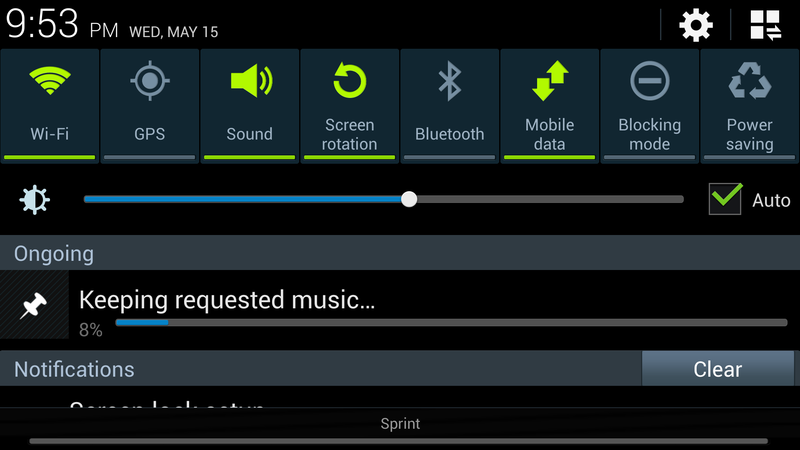 With it you can pin music for offline listening. But to start things off, the icon itself is confusing, and changes depending on what state the album is in. It begins as an angled gray pin in an also gray circle, which indicates you haven’t downloaded the content. Tap the pin and it changes to an upright white pin in a gray circle, and a Keeping requested music notification flashes at the top of the screen briefly. After that, you have no idea what’s going on because there’s no progress bar to indicate that it’s actually caching the music, just a white pin that sits there for a long time until an arc starts to appear on the circle. Only when I swiped down to access the phone’s settings and notifications did I see a download percentage, but when I swiped out and back it no longer showed me the progress there either. In any case, the process took a very long time—two and a half minutes to download a single 2:44 song. And when the downloading was finally complete, the icon turned into an orange pin. 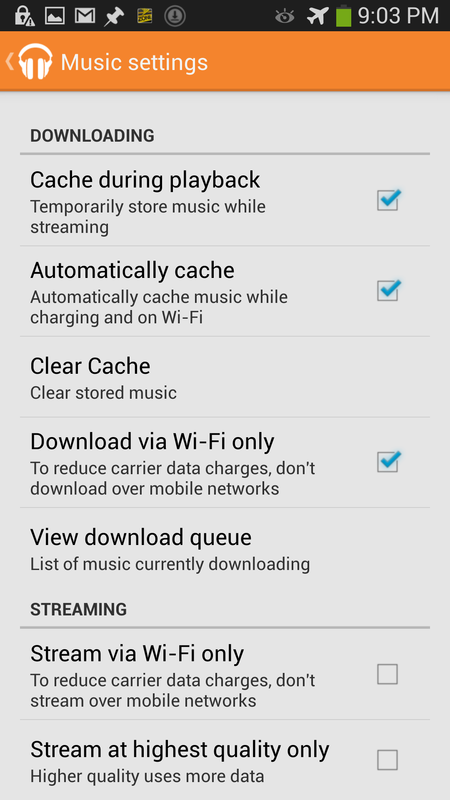 There’s also no way to set the size of the offline cache or see how much storage you're filling up. Google’s help page on the subject nicely tells you to “please make sure that you have enough storage space before saving music from All Access.” Of course, without knowing how much room albums or playlists require, that’s rather difficult. The download progress, as seen in the S4's Notifications. I did finally get full albums to download, although I’m not sure if that was my doing or because the Automatically cache option was selected in the preferences. Still, the process was slow and the feedback was minimal. A radio station built on the Grateful Dead's "Brokedown Palace." Google is late to the streaming music game. In addition to the five major streaming services mentioned at the beginning, there’s also Xbox Music. That’s not to say that Google doesn’t have the muscle to make All Access work, but to do so it will have to crush the very services that have to date been strong partners for the Android platform. iOS users are also left out in the cold with All Access, at least for now. And given that Google doesn’t even offer an official Play Music app for iOS devices, I don’t expect to see All Access on the iPhone or iPad anytime soon. For the same price as the competition (or less if you sign up soon) All Access delivers a ton of music at high quality. That’s the good news. The not-so-good news at this point is that the app and service are rather buggy and somewhat confusing to use. And leaving iOS users out of the game means 100s of millions of potential customers will go elsewhere (unless they want to be restricted to Web usage, which is a like half a service). If that’s the kind of working together that Google’s Larry Page was talking about, I don’t know what the future looks like for All Access.